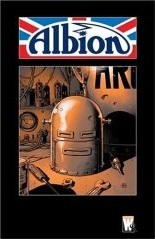 Cover to Albion issue 1, by Dave Gibbons. Albion is a six-issue comic book limited series plotted by Alan Moore, written by his daughter Leah Moore and her husband John Reppion, with covers by Dave Gibbons and art by Shane Oakley and George Freeman. As a result of a deal forged by Vice-President Bob Wayne of DC Comics and Publishing Director Andrew Sumner of IPC Media, it was published through DC Comics' WildStorm imprint. The series aimed to revive classic IPC-owned British comics characters such as Captain Hurricane, Robot Archie, The Steel Claw and The Spider (as well as minor characters like Fishboy and Faceache), all of whom appeared in comics published by Odhams Press and later IPC Media during the 1960s and early 1970s, such as Valiant and Lion. Debuting with a cover date of August, 2005 the first two issues were released monthly, with the third issue delayed two months (Moore & Reppion cited delays in scheduling impacting the art production). Initially solicited release between October 2005 and January 2006, issues 4–6 were subsequently resolicited, and finally released throughout 2006, with cover dates between June and November. The TPB collection followed swiftly after No. 6 was released in both the US and UK, from WildStorm and Titan Books respectively. The story revolves around a modern-day Britain where comic book characters have turned out to really exist. The British public had been largely unaware of their existence throughout the '60s and '70s, thinking them to be fictional. Most of the IPC heroes are now interred within an asylum (comparisons are drawn with Camp X-Ray), and the daughter of one of the inmates (who calls herself Penny) is determined to reveal their existence to the larger public. Using a similar narrative device to that which Alan Moore employed in Supreme and Tom Strong, flashbacks are related in the style of comics of yesteryear. For example, Penny Dreadful's childhood is drawn in a style similar to Dennis the Menace or the Bash Street Kids. A huge and muscular World War II hero who is the final line of defence in the government prison. He has an old-fashioned style about him; he uses quaint phrases ("The whole ruddy lot of us", "I could do with forty winks", etc.) and is casually racist. Captain Hurricane's origin is revealed in Albion, he is the result of hundreds of experiments to create a supersoldier through the use of drugs. His assistant 'Maggot' Malone is a medical doctor monitoring his condition and dosing the Captain's tea with sedatives, to prevent him from going into one of his terrifying psychotic "ragin' furies". Ian Eagleton, as a child "Junior Spy" he had many encounters with Grimly Feendish who terrified him. When he grew up, he became the Warden of the government prison that held all the heroes, villains and other bizarre individuals of his youth. Jason Hyde was exposed to radiation that resulted in him developing x-ray vision and mind-reading abilities. He currently works as a security guard in the prison. Once an America police detective who served in both Korea and Vietnam, he is now a member of Special Operations who is investigating potential problems in the Castle. A computer in the shape of a human head with a skull-like face and transparent cranium who was formerly the property of a boy named Brian Kingsley, the Brain is an "inmate" in the government prison who has become integrated with the prison computer systems and has predicted an upcoming disaster. The Cloak was a mysterious noseless and bulgy-eyed black-caped secret agent who admired The Shadow and was a self-taught expert at sorcery. Despite his service to his country he was arrested and placed in the government prison along with all the others. Cursitor Doom is an intense-eyed, shaven-headed psychic investigator and seemingly immortal sorcerer cursed to remain forever within the walls of his isolated castle who has been in a coma for the past “twenty-something years”, a condition which has allowed the government to convert his ancient home into a prison. Eric Dolmann is a master inventor and robotics expert, he has created a range of doll-like robots to fight crime. Over twenty years ago he was arrested by The Spider, an event that is witnessed by his daughter Penny. He died in prison. Faceache, Frederick Akeley has the ability to change or "scrunge" his face and body into a vast variety of different forms, many quite monstrous in appearance. He is a trustee in the prison and does impressions of Bruce Forsyth for the guards. He is dating Martha of the Monster Make-Up. Grimly Feendish (aka Grymleigh Gartside Fiendstien) began his life of crime over thirty years ago, committing crimes including theft, arson, murder and acts of gross indecency with the help of his monstrous little "Squelchies". He is eventually arrested and imprisoned in the government prison. Lazlo Gogra is an evil dwarf genius obsessed with possessing the towering robotic simian Mytek the Mighty. Tim Kelly rescued a South American shaman and was given a jewel called the Eye of Zoltec, also known as the Eye of Everlasting Life, which granted him invulnerability. He is currently a prisoner in the government prison, much aged after the jewel's confiscation. The Eye itself is shown to be in the possession of the British Prime Minister since the time of Margaret Thatcher. Better known as the Steel Claw, a prisoner and friend of Tim Kelly. Crandall has the ability to turn invisible by directing an electrical shock through his artificial right hand, causing him to vanish completely save for the metal prosthesis itself which seems to eerily float in the air. When Crandall was arrested the Claw was confiscated and locked away in the prison armoury. Martha has make-up that her father brought home from Anvil Studios which can transform her face into that of a monster. She is in prison and is dating Faceache. An incredibly powerful giant robot ape originally built to control unruly natives in colonial Africa which can be operated from a control room inside its head. James Hollis, had a curse placed on him by an Indian fakir that turned his body to rubber, allowing him to stretch great distances. He attempted an escape with Tri-man which failed. He is being stored in a cooled cell which negates his elasticity. The self-proclaimed "King of Crooks", this ego and intellect-driven black-clad, pointy-eared master criminal was employed by the conservative Thatcher government to capture all super-villains and superheroes, all eccentric inventors and magicians, and all bizarre freaks and weirdos and exceptionally rebellious or gifted children who could be considered to be disruptive to the orderly running of British society, and as his reward he was also imprisoned for, as the Spider himself admits, "Nobody does treachery like the English". He loves playing mind games and is always looking for ways to escape. Johnny Small obtained three amazing superpowers from Professor Meek's ray: super-sight, super-speed, and super-strength. He was a prisoner until The Spider encouraged him to attempt an escape with Rubberman, and he was killed during the attempt. Penny Dolmann, daughter of inventor Eric Dolmann, was a child who loved to get in trouble and play with her father's robots. She was put into foster care after her father was arrested by the government and had a very difficult time in school. She has inherited her father's inventive genius, and has been locating her father's missing "dolls" since she was 18. At the start of Albion she is looking for allies to find and rescue her father and the other heroes. A Victorian thief who travelled forward in time to the 1970s when he stole a magical watch from Cursitor Doom. He set up a music shop under the alias "Charles Love" and later took over an antique store. He became aware that the government was arresting unique individuals and is very careful about revealing his identity. A scruffy young collector of old British comics who was apparently orphaned in a bus accident that robbed him of all memory of his previous life. After recognising Grimly Feendish and calling out his name as the master criminal is taken away by the police, he finds himself literally dragged into Penny's quest to find her father and eventually discovers how the secret of his true history is tied both to the castle and to Cursitor Doom. A Victorian era hero who, born with rubber-like bones, is a brilliant escapologist who can escape from any trap and uses his amazing abilities to solve crimes and fight evil. Also known as the Buoyant Queen, the Queen of the Seas is a battered and somewhat less than reliable old ship whose small crew consists of the monocled, cigarette holder-smoking Captain Enoch and his portly first mate Bert. Robot Archie was an old-fashioned heroic mechanical man who was deactivated and served as a display in a cafe until Penny and Danny rescued and reactivated him. A tie-in volume entitled Albion Origins was released by Titan Books in November 2007 in hardback, with a cover by Brian Bolland. This volume was designed to showcase the characters featured in Albion as they originally appeared in various IPC, Fleetway and other British comics. It featured reprints of several Cursitor Doom, Tim Kelly, Janus Stark and Dolmann stories, as well as newly written articles exploring the history of these characters' comics. Thunderbolt Jaxon, a "spinoff" of Albion – written by Dave Gibbons and drawn by John Higgins, with covers by Gibbons – was launched as a five issue mini-series in 2006. A trade paperback was released in 2007, ISBN 1-4012-1257-3, which contained some additional info on the original character. Battler Britton, a five-part series (starting in July 2006) based on IPC's classic World War II air ace, Wing Commander Robert "Battler" Britton. Britton was the star of such comics as Sun, Knockout and the long-running digest titles Air Ace Picture Library and Battle Picture Library. The script is by well-known comics author (and World War II expert) Garth Ennis, with art by New Zealand's Colin Wilson. Covers are by Garry Leach. A trade paperback was released in 2007, ISBN 1-4012-1378-2, which contained some additional info on the original character. A trade paperback collection of the six-issue miniseries was released in the US on 13 December 2006 by WildStorm (ISBN 1-4012-0994-7). Titan Books published the UK edition a month later, on 26 January (ISBN 1-84576-351-3). ^ "Albion Origins". Archived from the original on 8 July 2007. Retrieved 4 July 2007.
International Hero – A website devoted to British comics heroes. "Comics: Return of 'The Claw' (Andrew Sumner interview)". The Independent. 22 November 2004. Archived from the original on 4 July 2014.